$2.49 to $169.99 & FREE Shipping on orders over $59 $35. Commercial quality beer bottle caps to keep your brew safe and sound from bottling day until you're ready to enjoy it. 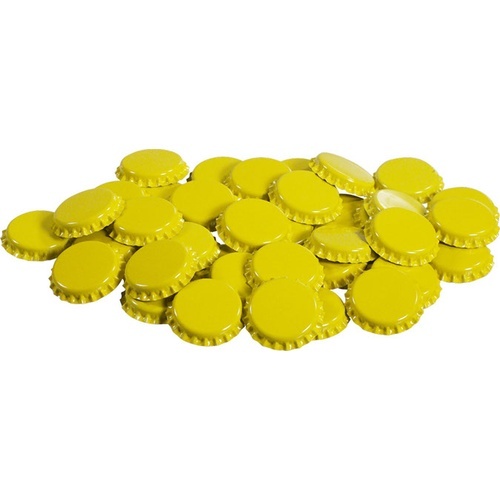 You will get a good firm seal that will last through transport, gift giving, and storage with these yellow bottle caps. These bottle caps crimp down onto the beer bottle and make a firm seal. They don’t rust or leak and they contain an Oxygen absorbing agent in the liner, which means you won’t get any unwanted oxidation. A good value for a great product. Important to note: It is recommended that you only sanitize as many caps as you'll require at the time of bottling. The oxygen-absorbing agent is activated when the cap gets wet. If wetted caps are saved for later use, they'll still function as a normal cap, but the oxygen absorbing agent may be depleted. Like pictured! A great yellow and a great capper.